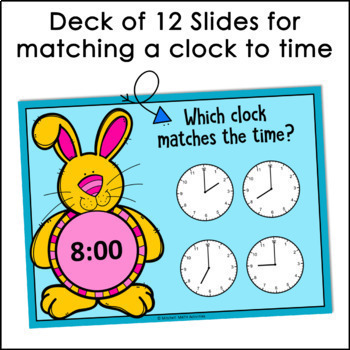 A set of 2 Click and Check Digital Interactive files that offer practice telling time to the hour. 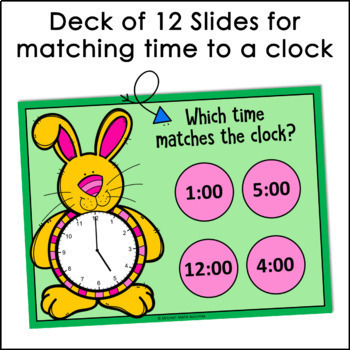 Each file has 12 self-checking slides for use with PowerPoint or Google Slides. 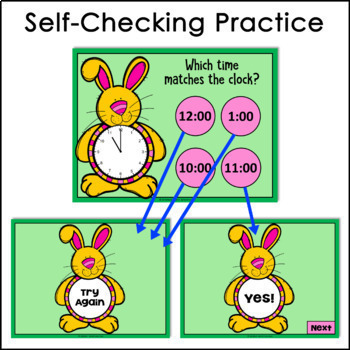 One file offers practice matching the correct time to a specific clock image and the other focuses on matching the correct clock to a given time. Each slide has 4 answer choices. Instructions are provided for using this resource with PowerPoint and Google Slides. To use the files with PowerPoint, you will need a device with PowerPoint installed. To use the files with Google Slides, you will need access to the Internet and a free Google account. IMPORTANT NOTE for use with Google Slides: If the device your students are using has a margin around the slides, they will need to avoid clicking in the margin. The slides will automatically advance when the margin is clicked instead of following the proper slide progression based on their answers. 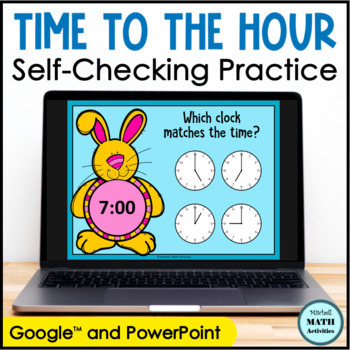 Students will be motivated to practice their time-telling skills with these engaging and self-correcting DIGITAL Interactive files! They will work at their own pace by clicking on “buttons” to advance the slides. Correct answers link to a slide that says “Yes!” and then to the next question. Incorrect answers link to a slide that says “Try Again” and then back to the missed question. I am interested in hearing your feedback!